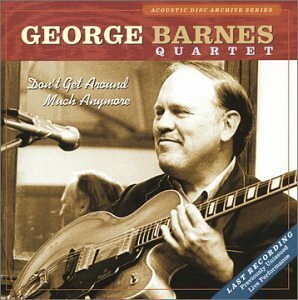 Often overlooked in a sea of more modern-sounding, bebop-oriented guitarists, George Barnes could swing like mad and spin out intricate, frequently bluesy phrases with awesome precision and musicality. One of the earliest electric guitarists, he began his career as a teenager in ’30s Chicago, where he worked as a sideman for bluesmen like Big Bill Broonzy and Blind John Davis. Later, he moved on to be an NBC staffer, and then play with the likes of Armstrong, Sinatra, Fitzgerald and myriad other luminaries. Don’t Get Around Much Anymore-issued by mandolinist David Grisman’s Acoustic Disc-features heretofore unreleased material from a 1977 Concord, Calif., concert that was recorded a little more than a month before Barnes’ sudden death at the age of 56. Here Barnes leads a quartet-manned by Bay Area rhythm-section veterans drummer Benny Barth and bassist Dean Reilly, and guitarist Duncan James, one of his students at the time-through tunes that, for the most part, were featured on the last two albums he made for the Concord label. From start to finish, this well-recorded performance demonstrates the qualities that qualify Barnes for a position among the most elite players in the annals of jazz guitar. Highly stylized and melodic, his work on ballads like “I Can’t Get Started” and “When Sunny Gets Blue” is rhythmically complex despite his relatively simple pitch vocabulary. Possessing flawless time, he effortlessly swings his way through uptempo numbers like “Sweet Georgia Brown,” “Pick Yourself Up” and “Theme From the Flintstones.” And his more soulful side comes to the fore on his own “Blues Goin’ Up” which ascends chromatically key-by-key until it arrives home an octave higher 12 choruses later. Throughout, his strong arrangements-“I May Be Wrong,” “Three Little Words” and “Why Was I Born?”-reveal an abundance of ideas, including highly effective rhythm section parts and expert ensemble writing.